Scattered around the 43 acres of the Olcott grounds are a number of special places. Anyone who has been to the national headquarters knows about the Labyrinth. At all times of day it draws people from around the area. Many bring their children with them to make the winding meditative walk to its center. About one hundred yards south of the Labyrinth is the Stone Circle that used to be a gathering place where the Young Theosophists could build bonfires in the days before the city code prohibited them. There are the Sellon Grove, the Garden of Remembrance, the Pierre Garden, the Peace Pole, and other sites. 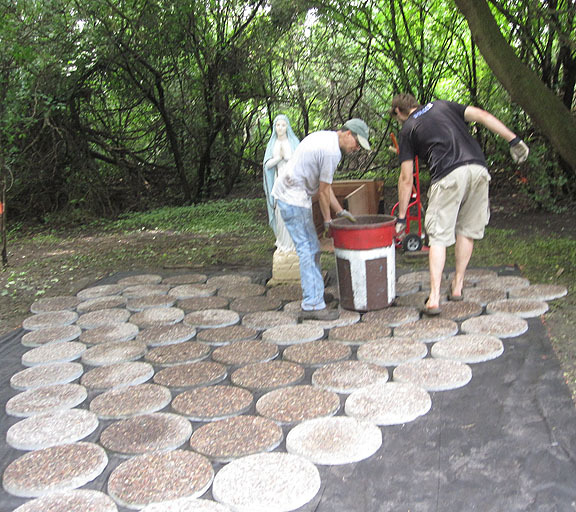 For the last twenty years there has been a largely unnoticed shrine to Mother Mary about 50 yards beyond the west parking lot. It is situated in a dense grove of trees which with time has become overgrown with buckthorn and wild grape vines. Over the years a few devotees have regularly visited the shrine leaving flowers, prayer requests, and various offerings. Many of them have felt a strong presence of peace and blessing at the spot. During the years Mary has been there some things have changed. The ground had settled and she and her little shrine building were starting to lean to the right, and the undergrowth was closing in. 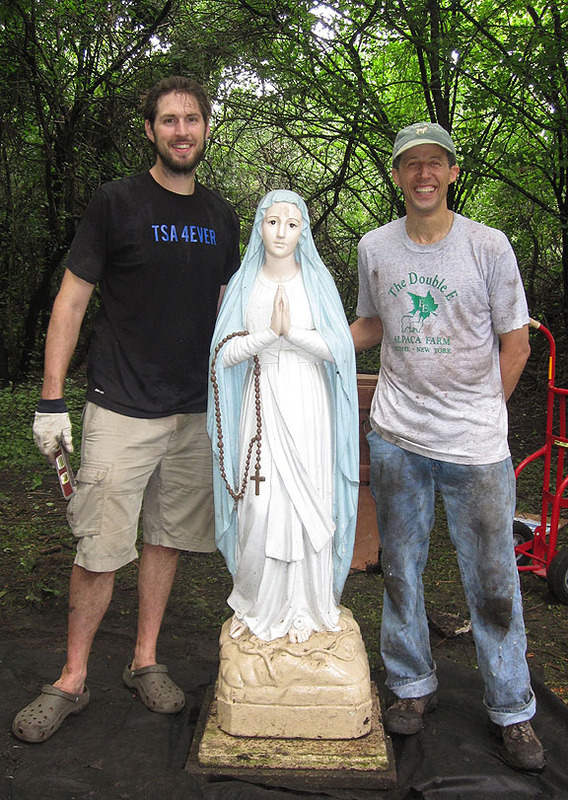 Deciding it was time to give Mother Mary the respect she was due, Lily Boyd and Diana Cabigting began the project at 6 o'clock in the morning on August 6. 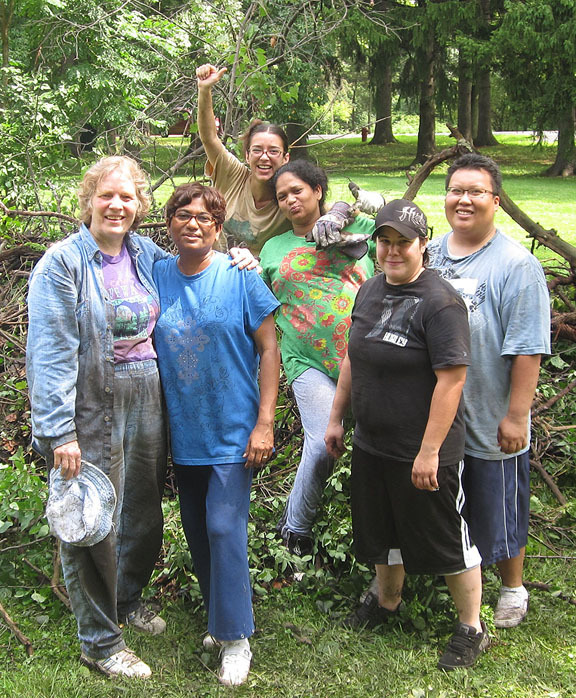 They were joined later by Olcott residents Danelys Valcarcel, Angelique Boyd, and Juli Cesano, as well as volunteers Kathy Arseneau, Maryann Barlan, and Giana Waddell for the dirty, sweaty, and mosquito ridden work of clearing out the undergrowth. Later in the day they were joined by Chris Bolger, Tim Boyd, and Clifton Waddell to do the bull work of landscaping. The husband and wife team of new TSA members Clifton and Giana Waddell built the protective structure around the statue. By 9 o'clock that night, under the light of a couple of flashlights, the last nail was hammered. On their way home the crew witnessed some unexpected after dark visitors to the newly renovated shrineâ€”a family of skunks and a coyote. The following morning was set for the official consecration. Liberal Catholic priest Diana Cabigting officiated. The sky was dark when everyone arrived at the shrine and it only continued to darken as the time for the ceremony approached. 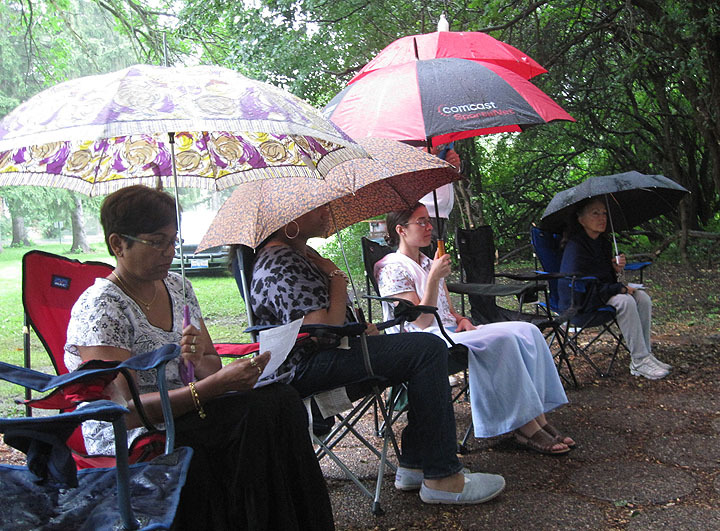 As the ceremony began, so did the rain, and as the ceremony continued, it began to pour. However, as soon as the ritual ended the clouds parted and the sun broke through! It was a memorable event for everyone attending. Diana made the point that the name Mary comes from the Latin word â€œmareâ€ which means â€œseaâ€ and that the water from the sky was an auspicious sign of Mary's presence and blessing. 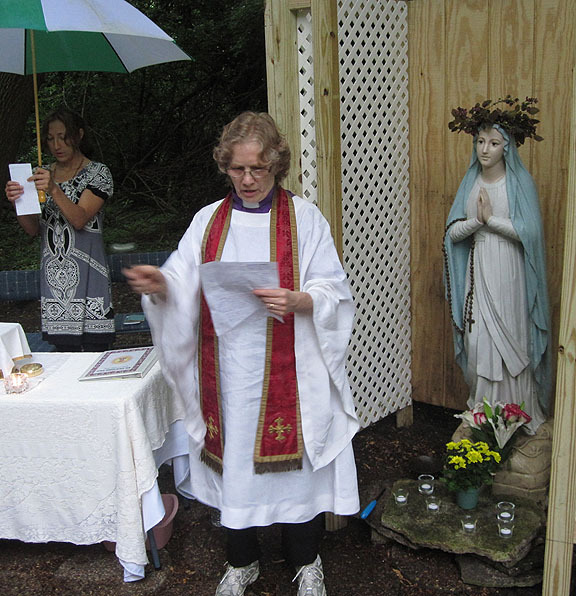 In the days following the renovation and consecration many people from the Wheaton community came forward to say, â€œThank you,â€ for the attention given to Mary. Some of them were moved to tears by their gratitude and devotion. It has been quite remarkable to connect with this previously invisible group of peopleâ€”most of whom are not members of the TSA and many of whom have never entered the headquarters buildingâ€”who have drawn sustenance from one of the special places we have prepared on our grounds for people of all faiths.